Honestly, I feel like I’m embarking on an arranged marriage.Â I’m worried about everything. For those of you who may not know how dogs help gimps, you may enjoy reading the NEADS website.Â If you like the idea of prison reform, check out the Prison Pup Partnership video.Â Don’t watch the video about Canines for Combat Veterans unless you have Kleenex handy. And one other thing.Â My new dog was born in the Czech Republic and his name is Cormet, which really doesn’t work for me.Â Among other things, it’s a strange sound to the American ear, so unless I change it, I can plan on spending a lot of time repeating and spelling it.Â Dogs don’t care if you change their names.Â To a dog, a name is just that sound the two-legged one makes when she wants your attention.Â So I’d love some ideas.Â I’ve considered Reacher, Jake and Rover, but I’m stuck. Handsome fellow… Keeping close to the original, Kermit comes to mind, which shouldn’t cause any confusion with anyone. But maybe more appropriately, Corbett, as in Gentleman Jim. Nice-looking dog. Is a Shiloh Shepherd really different from the German kind? Looks like the back might be straighter, which is a good thing, as I understand it. Since he’s from the Czech Republic I was going to suggest “Checkers,” but thought better of it. Cormet is not a Shiloh; he is a pure German Shepherd from European bloodlines. You’re right that he has a straighter topline than American-bred GSDs. All GDSs have angulated femurs that have nothing to do with hip dysplasia. The unusual angle of the femur allows the dog to expend less energy when trotting, so he can work long hours without exhaustion. Unfortunately American breeders seem to have fallen in love with overangulation, and their dogs sort of sidle along when walking. 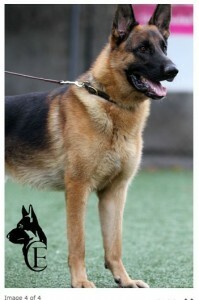 I have not had good experiences with American GSD due to temperament problems. I need a bomb-proof dog who will not react badly to the stresses of city life. The major difference between the GSD temperament and that of the Shiloh is that if a representative of each breed was confronted with a chaotic scene like rush hour in a subway station, the GSD will think “This is intolerable. Someone has to fix this mess, and I guess that’s me, since all these 2-legged ones are not getting it done.” The Shiloh thinks, “Glad it’s not my problem.” Then he goes to sleep. So is it the overangulation that causes what often looks to me like the excessive slope of the back? I’ve got a Shiloh and had a GSD. Imagine that somebody took a wolf, painted the muzzle black, emptied it out, and filled it up with marshmallows. That’s a Shiloh. They’re not nearly as smart as GSDs (neither am I), but they are tremendously sweet animals. We got a Shiloh after our GSD died because we have a small child. You can trust a GSD with your child, but you can’t quite trust it with your child’s friends. The GSD might decide to protect your kid from its friends; the Shiloh will only wheeple. As far as I understand, Shilohs are mostly GSD with some northern breeds thrown in. They are similar to the Alsatian Shepalute, another rare breed from the West Coast. A Czech GSD is much more than a properly-angulated GSD. They’re really tough dogs who need a lot of work: German Shepherds a fortiori. Cormack? McCormick? Easy to spell/”get” for English speakers, dog still comes when called. Just what I was thinking! Another possibility is “Corey” or however you want to spell it. Dogs apparently respond best to long vowel sounds so “Corey” is a very appropriate name for that reason. If you don’t mind the military reference: Corporal strikes me as a nice name for a service dog. I also did the same thing with one of my dogs. He was given the name “Huey” which I thought was very undignified, so I changed it to Hugo, which I still think is a really nice name for a dog, so I would nominate that one as well. Two great posts in a row. It’s wonderful to see you in the mix here. Well, if Rover made the cut, why not Spot or Fido or Blue? Hi Lowry. How delightful to find your articles on one of my new fave sites. Baloo, one of Blue’s littermates, is still w/ my guy and me. We’d kept up w/ Blue through JV and were sad to hear he’d passed. I’m glad for you that it’s time to begin with another helpmate. He’s beautiful and looks sincere and solid. Yeah, Corbett would be high maintenance, plus it doesn’t roll off the tongue. Does anything about your process of becoming ready for another dog suggest a name? Anything regarding the city where he was born, the region, a body of water near his birthplace, etc. that would be a cool name? Or, is there anything symbolic about how you found him or the process of him getting to you that might help? And, naming a dog this way may not be your style. If you post about him online, I’d love to follow you two. My long experience with dogs suggests that names with hard consonants are more readily responded to. Think C and K and T. Good luck to you both! They not only help gimps. I was in a mandatory VA discussion group in 2002 or 2003. None of us opened our mouths for a while. One guy asked if he could go out and water his dog. Everyone but me was from the streets, they all had dogs. A buddy to hold the perimeter while they got a nap.